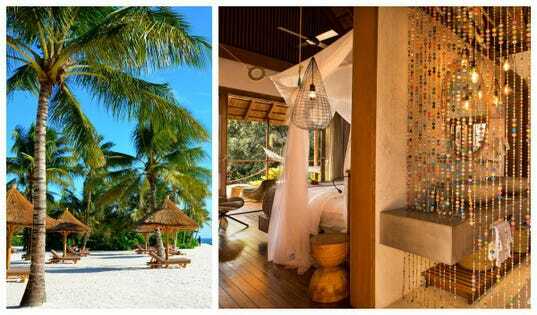 From the sugar-sand beaches of Zanzibar to the ice-blue waters of the Maldives, these new beachside sanctuaries are perfect for unstuffy R&R that still packs plenty of luxury. Opened in July 2018, Zuri Zanzibar is the embodiment of exoticism: There are 55 bungalows, suites and villas that straddle the line between jungle and sand. With lush private spice gardens, open-air yoga decks, hammocks aplenty and glass-still seas teeming with dolphins, turtles and tropical fish, you’ll feel far from civilization (even though you’re only an hour away from the UNESCO World Heritage site of Stone Town). With serious design cred (it’s the first Design HotelTM on the archipelago), Zuri Zanzibar serves tropical cool vibes from sunrise to sunset: Start your day with a sunrise meditation with Inka in the yoga pavilion; then go for some breakfast at Upendo where you’ll feast on fresh fruit, hibiscus juice and fluffy pancakes; spend afternoons in the resort’s airy and arty library or swaying on the hammock of your private terrace; and kick-off dinner with a colorful craft cocktail at Peponi Bar. (Try the Swahili Dawa cocktail: meaning “medicine,” it’s a mix of the local-spirit konyagi, lime and honey). Don’t miss the epic sunsets on Zuri’s private west-facing beach. Slated to open autumn 2018, Wa Ale Island Resort is the first luxury property to introduce Myanmar’s gorgeous Mergui Archipelago to the world. Previously closed to tourism, this collection of 800 islands is the stuff of pure fantasy. Boasting castaway vibes and bohemian décor, Wa Ale is an ideal base to explore this uncharted territory. With about one year under its belt, Habitas Tulum has already made a name for itself in the chic hippy haven of Tulum. With interiors centered on local hardwood accents layered with artisan pieces, this is a true haven for free spirits. If peace and privacy are what you’re after in a beach vacation, look no further than Kokomo, the private island retreat in Fiji that opened in the spring of 2017. With green and wild jungles of waterfalls and exotic birds and tropical reefs right outside your door, there’s plenty of adventure to be had by way of diving, deep-sea fishing, trekking, and surfing. The Maldives is no stranger to barefoot luxury retreats, and Joali, slated to open October 2018, is bringing more of that sustainable-but-sophisticated glamour to the beach. Celebrating craftsmanship and creativity, the architecture and art-filled interiors by Autoban and Tokyo-based Studio Glitt are at once refined and welcoming. And the views? They’re picture perfect.